Available online via Swiftboox for just $2.99 and you can download a free sample. For all you young writers out there, this novel can give us all hope. As proven by Tista Ray of India, it is possible for a young writer to get a book published. Ray’s novel, Melancholic Delight, is a short read, but it’s not a book that is easily put down. As I read, I found myself quickly drawn into the captivating story line. 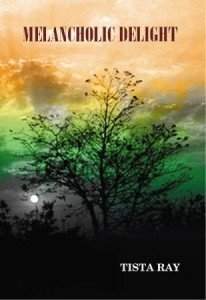 This book is a typical romance, but the unique culture of India is so intertwined into each chapter that Ray’s novel reads like nothing I’ve previously encountered. And trust me when I assure you that I read a great deal. The plothas multiple relational themes melded together. It tells the story of the main character, Sri, and her dynamic interactions with friends, parents, herself, and a certain someone of the opposite gender. Reading Melancholic Delight is a similar experience to embarking on an emotional roller coaster with both much enthralling delight, but also melancholic sadness at times when things aren’t going right. Melancholic Delight is not a book that is easily put down. If you’re the type of reader who easily gets caught up in the main character’s plight you will probably get through Ray’s book in just one or two sittings like I did. Published in January 2013 by Smitri publishers, this is a book I highly recommend, especially for teenage girls ages 15-18. Note that there is the occasional colourful word. At just $2.99 for 80 exciting and educational pages, this is a very good deal and I hope many of you will make the most of this opportunity. It’s a chance to read an excellent book, learn about what is likely a new and foreign culture to most of you, and show support for a fellow young writer. Thanks a lot, Valerie for writing such a great review of my book. Also, thank you so much, Laura for featuring my book in your blog. You are very welcome. We are truly delighted to support talented young writers such as yourself.